Excellent condition Hummel wall plaque! 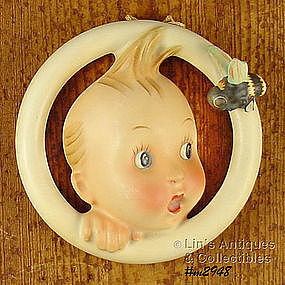 This is the “Baybee” plaque – a little boy somewhat startled by a bee. Plaque measures 4 ¾” diameter, back is marked 30/OA, Hummel, small bee in a “V”, M.I. Hummel, Western Germany. The marking indicates production period of 1960/72. Super collectible item!